I began the process of having trousers made by Salva (-tore Ambrosi) just over a year ago. Since then I’ve had two pairs made – in fresco and flannel – and while the quality of the product has been good, the process hasn’t. Salva had problems with delivery when he first became popular; trousers were often late or didn’t appear at all. I think it’s important to say first that I have had no problems in that regard. My trousers were always delivered when they were meant to be, and at some points were turned around very quickly. The problems were with consistency. The first finished pair I received fit very well: the waist was perfect, as were the hips and the length. And this is not a usual occurrence – most tailors find it very hard to get the fit right on my seat and thighs the first time. But the legs were too wide. This might have been a communication problem with inches v centimetres. But they also weren’t half lined, as I had requested. And they had brace buttons rather than side tabs. I returned them, and received the corrected pair when Salva was next in London (dealing with Salva directly throughout – not the Armoury). The brace buttons had been removed, and the legs narrowed. But there still weren’t any side tabs, nor a half lining. An important point here is around communication. It turned out that it wasn’t possible to add side tabs, as there was no more of that piece of the cloth left. But Salva didn’t mention this until I asked why they weren’t there. Customer communication and service like this is something a lot of tailors aren’t good at, but I know they lose customers among bespoke newcomers as a result, and that’s a real shame. Salva offered to make a second pair, and these were a lot better. A nice grey flannel, with the right measurements and details. The fit wasn’t quite as good – the single pleats that had been suggested opened fully, immediately, and therefore lost any function – but otherwise they were an improvement. Unfortunately there was still a problem with consistency. I asked for a slightly wider waistband after the fitting, and this wasn’t done on the final trousers. I know a lot of people that have fantastic trousers from Salva. When he gets it right, he nails it, as they say. But it’s hard to persist when there is this number of errors – particularly when you live in a city where there are so many alternatives. Price is also an issue. At around €1000, Salva charges about the same as a Savile Row tailor. And of course he has to travel a lot, which has its own costs. I have been tempted to spend that amount with other tailors when the trousers were absolutely perfect. John Malone at Anderson & Sheppard, for example, probably cut the best trouser pattern for me ever. And my Cifonelli trousers – as you’d expect – are absolutely beautiful. But it’s very hard to justify that price with the lack of consistency. You’re just not prepared to risk the disappointment. And particularly with trousers. Like shirts, there is a lot less room for style than with jackets. You want a consistent trouser that you can order up in any new cloth you see. A couple of new linen for the summer; cream flannel and cavalry twill for the winter. I really like Salva (which shouldn’t be relevant but inevitably is). But on this evidence he can’t be that maker. Note: As with all my photos, I like to shoot things when they have been worn, rather than just pressed to within an inch of their life. I think it’s more realistic. These fresco trousers had been worn for a day and a half since their last press. You can follow the discussion on Salvatore Ambrosi trousers – review by entering your email address in the box below. You will then receive an email every time a new comment is added. These will also contain a link to a page where you can stop the alerts, and remove all of your related data from the site. I had a problem with my first pair – waist too tight, legs too short – but this was quickly rectified and the two pairs since then have been perfect. In fact, I would say that they were by far the best-cut trousers I have. That’s of course not to deny problems that others have had, but just to reiterate that, as you say, “When he gets it right, he nails it” – he really does! Totally agree with you Jason. When he gets it right, he nails it. As far as I’m concerned, his trousers are extraordinary. Price is high but in line with the quality of the product. I was expecting this article for a long time, given the popularity of Salvatore on the Internet. It is very honest from your side to point out all the problems with your order, and sadly it confirms what has been said about its inconsistency. Otherwise, the trousers look amazing, though too wide as you say. Would you recommend another trouser-makers in Napoli? Pasquale Mola? ps: I tried to contact with Luca Avitabile for ordering the Friday Polo, do you think it is out of stock right now, I haven’t had any answer yet. Hi Nestor – Friday Polo orders will be done through me, as per usual, and launch on Wednesday! Thank you Simon for your honest review. Can we have a review of trousers made at Anderson & Sheppard haberdashery ? Sure – I don’t own any currently, but I’m sure we can fix that! Can you please let me the number for the Fresco? Many thanks. It’s 0546 From Minnis Fresco II. I have been thinking about the customer service aspect of tailoring for a while now. Customer Service is something I’m interested in professionally and I have had some not so good experiences with tailors over the years. My bespoke guy is patchy, I’ve had things come back not quite as I specified or in one instance completely wrong (it would have been easy to check before I came in). Although recently he has certainly up his game. Like wise I was in town a couple of weeks ago and went to a few of the bigger name tailors RTW shops around the west end. Given that it was 11 O’clock on a Tuesday morning and they weren’t overly busy I would have expected at least passable service, but 4 out of the 5 fell well short in my expectations. It was like they couldn’t be bothered with me. E Tautez was a very notable exception. The guys there could not have been more helpful. To the extent I am pretty much certain I will go to Norton for my next suit. When you are investing £3k plus in a suit I expect the whole experience needs to be positive. I think many focus just the product, which is very important and don’t spend enough time on the experience. That’s very true, Jamie. And I agree they should do a lot of things better. I think the only thing on the other side is that tailors are not luxury businesses, despite being expensive. As in, they don’t spend the amount on staff, IT and everything else that any luxury brand does. If you’re spending 3k on a suit that would cost 4k from a normal brand, these are little things you lose out on. Debateable whether they should be spending it on those things or not. Certainly people shout a lot about some tailors being more expensive than others – and they expect that extra expense purely to be in quality of production, not customer service. Exactly – though a lot is buried in that word ‘value’. Most don’t include customer service as part of the value of a product. I’ve been wearing bespoke for over 35 years, and have rarely seen a tailor use a pen to write things down beyond the initial order and measures. A lot of changes are only marked in chalk, or,very occasionally, pinned. On this basis, you can understand why errors occur. I ordered two pairs of trousers from Salva about five years ago and I paid about £700 per pair. This was when he was just starting out and the trousers were cut in his Naples workshop by his father. I was very happy with the end result but the process was frustrating. My order took approximately 6 months to receive as he initially forgot to make one of the trousers. I also like the guy- very charismatic but the process has put me off reordering. I’m also not sure how many trousers are made on site in the Naples workshop and didn’t really like the button down fly although have grown accustomed to it. I agree that you really must make sure you communicate your choices and these are reinforced despite the language barrier. Interesting I have my shirts made by Fiorenzo D’Avino and the entire process was incredibly professional and a great pleasure, despite the language difficulties. I didn’t have a button-fly on either of my pairs. I don’t like them – nor do I find the French bearer makes any difference to the fit. The Neapolitans and Cifonelli do this, but they fit no better, and are no cleaner in look, than say A&S or Camps de Luca who don’t do it. The first sentence of Simon’s review says he started dealing with you a year ago, and you think this happened “7/6 years ago”? Something got lost in the translation. I believe Salva was replying to Ian.
) that they were useful only for overweight men and those wearing trousers at the natural waist. I was interested in trying them with Salva because they look good on many friends. And I do like the look of them, but that original point is correct that they’re not doing much to help functionally here. The wider leg also helps. As mentioned, on my second pair I had a single pleat with a narrower leg, and the pleat simply opened fully, never to close. Thank you for sharing this very honest post. It really helps to put into perspective some of the issues I’ve been having with other tailors and things generally. I was having similar issues of communication with another of your favoured visiting tailors but I’m more than happy to report that Luigi Solito, who has cut a pair of trousers for me did a wonderful job of nailing the fit first time, albeit with some effort in getting my preferences right, i.e. side straps instead of belt loops, no lining was added despite asking (as you’ve reported) and issues with pleats when not requested. The aforementioned were rectified easily and the fit was so good that I have ordered another pair. The price was also very reasonable compared to SA, although I appreciate that the finishing and finer points might not be comparable. 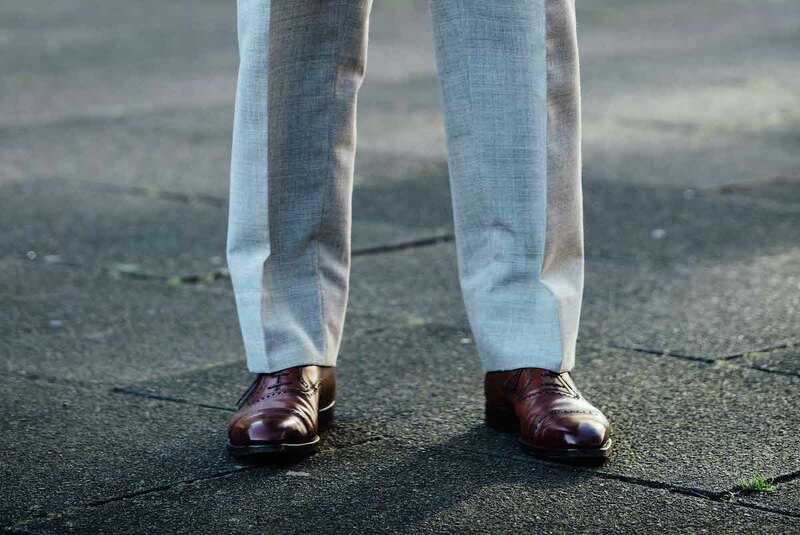 For the reader that has requested a review of A&S haberdashery trousers – I have two pairs in their ‘Style No.1’, a flat front with side adjusters, which I cannot recommend highly enough for fit and quality. Naturally, with RTW I would always suggest that you visit the store if possible, if anything for the excellent customer service of all the A&S Haberdashery staff. Simon,i have a question for you. Why,as in use in English tailoring,you don’t have ask for foward pleats in this Ambrosi trouser? Of course,In Italian tailoring pleats are almost ever reverse,but if customer ask the tailor can make foward pleats too. I think that foward pleats are more flattering and trim ( i ask always for reverse pleats to my tailor). This sounds and looks like a complete debacle and would have me running a mile. The best bespoke trousers I have ever had were cut by Oliver Spencer @ A&S. He has made two for me and both were spot on. He even makes heavy cord look elegant – not easy! I would also endorse J’s comment about A&S Habadashiery. I’ve had three pairs from them and they have all been great and reasonably priced. They must have the best trouser selection in London. Thanks for sharing this experience and it end result. From the pics, there are obvious details one rarely sees on trousers indeed. As you know, a lot of things are highly subjective. For instance, you mentionned the larger waist band you had expected.To be honest, I prefer this one. I’ve seen many larger ones, but found them utterly unattractive! As to your other complaints, I hope Salva would heed them and DO HIS BEST so that he could remain on top of the game! By the way, you seem to have darkened your Bremer oxfords, Simon! Haven’t you? Yes you’re right, things like the waistband width are definitely subjective. Good to get what you ask for though. And to be fair to Salva, he has reacted very positively to the review, recognising the issues and welcoming the feedback so he can try and improve his service. Few brands I criticise react in such a constructive way. I’ve used a few tailors to make trousers over the years. The only pair that were right first time, and I’ll be reordering are Levis bespoke. Thanks Lizzie. Nice post. I know you didn’t hit it off with Crowes in the City. But they have made me grey Fox Flannels for years. They, as you say nail it for me! Keep up your good work. my reaction, is also due from my sins .. sometimes we all forget that the mistake and out the door, and we must be attentive to the service we provide our clients have … I always try to take criticism constructively, and nondestructive .. criticism help improve the product, and give us new ideas to move forward .. I thank you for taking time to talk to me And my trousers .. Think we could get a post on your best fitting pair of trousers and what makes them so great? Would be very interested to hear your thoughts. I’ve had a similar experience with a tailor and feel for you. It’s gut wrenching to wait months for a product to then receive something that’s not to spec. Ultimately, whether they’re a nice guy is irrelevant. You’ve paid for a product that you’ve not received. I’m afraid in situations like this, it’s best to walk. I’ve thought the tailor who delivered sub-par products to me was a nice guy. However, ask yourself this, if he was a decent chap would he have handed over a sub-par product? I think one has to be careful not to conflate issues of integrity and issues of miscommunication. An issue of integrity would arise if a tailor had claimed a certain level of quality in the material or manufacture that wasn’t there, i.e. a misrepresentation. I don’t think anyone is claiming that Salvatore does that – on the contrary, the product is indisputably of high quality. I think the issue is around communication rather than integrity. I think, except in those rare exceptions, the craftsman is at odds with businessman. An expert craftsman blends skill with creativity, and can come with the temperament of an artist. When you expect a high level of customer service due to the price, it can create a gap in expectations. I was just thinking about this piece. To me I find making trousers dreadful. They should look and feel great whilst standing, sitting and walking and not many tailors I’ve tried have done a great job addressing this. I see that you didn’t opt for the more tapered and shorter opening with 2-inch cuffs? or do you prefer a slight break in your trousers? and what do you think of the military/slant trouser hem? I had the second pair more tapered with a 2-inch turn-up. Those are not flattering fit on you, especially at those prices. I’m also surprised to see plastic buttons on such an expensive pair of trousers. I use admittedly much cheaper tailors in Hong Kong for trousers, but they still use horn for any visible buttons. Is it your preference to wear trousers so low? I have a rather pronounced seat and find that a high rise is more suitable for me, both aesthetically and mechanically. Simon, I’ve always wondered why you feel that way about high-waisted pants. Andreas Weinas, for example, wears his on his natural waist as far as I know and it looks great on him without a jacket. Maybe it has to do with the ratio between hip width and waist? Great, honest article and excellent photographs Simon. Like Rob before me, I’d like to know the code of the fresco please. It looks like the swatch of 0546 I have, or possibly the lighter weight 0500. I’m interested to know how to tell which swatch a cloth comes from if you don’t know who made it? I would imagine these are not made with an English cloth though. Fresco is the trademarked name of this cloth which is manufactured by Huddersfield Fine Worsteds under the J&J Minnis brand. Other mills make similar cloths, however they can’t call it Fresco. It is not a general name for a type of weave that can be used by anyone, for example a hopsack. This meant I could identify the cloth manufacturer of Simon’s trousers straight away. Apologies if your post wasn’t directed towards mine – I’m assuming it was though. I agree capital F is Minnis, small f is generic. Is your trouser made from Minnis fabric Simon? Probably the same people who call their vacuum cleaner a Hoover, no matter what the brand! Thanks Simon, let’s hope Salva is able to confirm the code. Forgive me if this is the wrong place to ask, but I have an urgent matter that needs to be dealt with asap. A few weeks ago I commissioned an MTM leather trench/overcoat which has now been made but I was informed that it lacks a vent in the back. My question to you then is whether a ventless overcoat would look odd/out of place? Because it is a “single panel” construction, would I be ill-advised to request an alteration? Please do let me know when you find the time. A prompt and succint reply. Many comments made here are obviously from folks who have just started paying attention to the value they could gain from taylors and dealing with them. Hi Simon . For ten years I am a client of Pasquale Mola for trousers. I order it from Sartoria Costantino (Costantino Puzo ). It’s absolutely amazing and I never have any problem with it. The price is reseanobale 400-500 euro. Also I cand recommend antica Sartoria leonardi . The also make beautiful bespoke paints with reasonable price. Hi Simon, in you response to Hazwan he/you mention slanted trouser hems. Something I’ve wondered about since seeing an image of the actor John Barrymore in a beautifully tailored suit (with military hems). Could you expand on the aesthetic benefits and the parameters of cut (what is a reasonable drop between front and rear seem). Furthermore how does it get applied to wide, medium and slim leg cuts of trouser? With 46 + comments interest in this subject area is clearly strong! How tight can one pull a tie? Americans in particular tend to have very very loose knots but I like having a very very tight knot to make it v small… Is that bad for the tie? It might cause more wearing of the material over time, yes. Perhaps just a tight knot, rather than a very very tight one? Very interesting point about bespoke not necessarily being luxury, despite being expensive. Had never really thought of it in this way before. Interestingly I think many English tailors (Thom Sweeney and Steven Hitchcock being the two I know best) have done a great job combining the two. Perhaps not always the case with some Italian makers, despite excellent finished products. FWIW I agree with the other commenters that those trousers would look better worn a bit higher on the waist (ideally with some braces to stop them falling down.) You are fortunate to be skinny with long legs so the benefits won’t be quite as significant as for some people (like me!) but I think the style is much more flattering, even when worn without the jacket. Nice and honest review Mr. Crompton. I also had a huge delay when ordering from Mr Ambrosi, 8 months and more importantly, pants were not the way i ordered, and the reasons that i received were false. At this price, it is simply disappointing. Other friends of mine in Paris had good experience with him, but none would say that the service and the quality were worth that price. How have you felt about your Thom Sweeney trousers compared to others you have had made? I have problems with all my trousers getting caught on my over the calf socks. It sometimes keep the legs from falling down after sitting down, and it looks like the pants also folds under the knee due to this. I will try and widen the leg a little to avoid this, but do you think lining all the way down at the back would help? Does this have any disadvantages? This is normally due to a combination of unlined trousers (even half-lined helps), big calves, and narrow trousers. I think the trousers look fantastic despite the delivery issues! 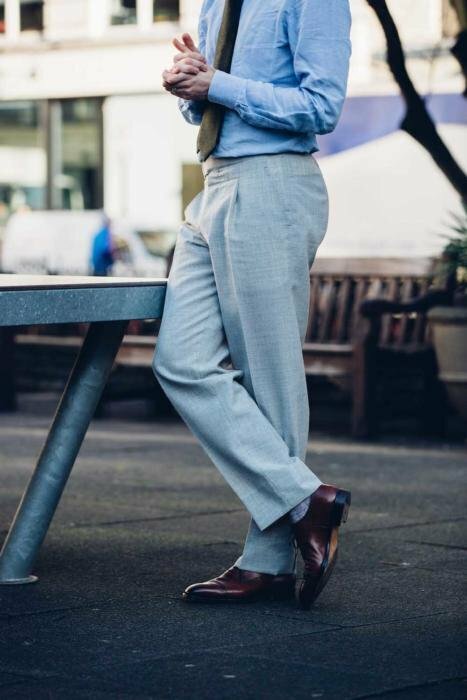 Simon (or Salvatore) – what fabric and colour would you recommend for a summer trousers to be worn with a linen shirt and loafers (& probably no jacket)? Lots of things, but try fresco (as here) or worsteds like Crispaire (my Dalcuore suit) first. Thanks, Simon. 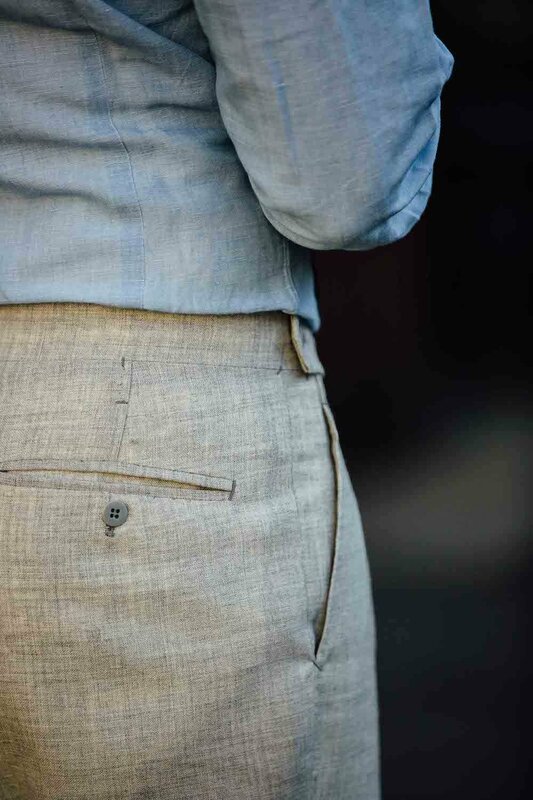 You wouldn’t recommend linen for the summer trousers then? Do you really think contrast in texture matters all that much? I read somewhere that he does the pants part of the suit for Sartoria Formosa. Is that accurate? what do you think about the Chittleborough and Morgan trousers? 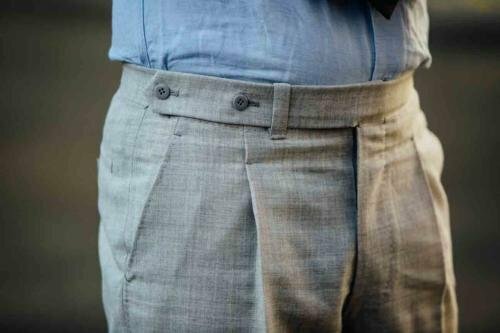 I know that you don’t like such a high waist style of trousers, but it seems to me that they are doing better shaping of the trousers than most other bespoke tailors. I plan to order trousers from them on my next trip to London (this would be my first experience with British tailoring) and I was a little bit surprised that you rather mentioned Cifonelli, Caliendo and A&S. They indeed put a lot of work into their trousers, more than pretty much any English tailor. And if you like high-rise like that, I would highly recommend them. Hi Simon, I so thoroughly enjoy this article that Ive read it a few times. Since my first reading, I’ve ordered several pairs of Salvi’s trousers and I love each pair, including several of his RTW. But now that I have a more intimate perspective, I was wondering if Salvi’s “oversight” with respect to the side tabs was actually an oversight in fact. I own the identical design as you (it’s one of his most standard now) and because of the extended tab that reaches all the way to the side, I am not sure where side tabs would actually be placed. Also, none of my pants with Salvi are lined. I was usually told that he’d do it if you want him to, but…” I never can recall what exactly came after the “but” in each case, but whatever is was it always made me hesitate to ask for the lining. Finally, as being classic in style, I’ve alway known you to have your trousers cuffed. Here you did not. It looks nice without a cuff and I’ve since had a suit made without cuffs and wider than usual at the leg opening, noticing how great yours looked. What’s your philospohy on cuffs if you have one? Thank you as always, Simon. I know what you mean about the extended waistband, but I didn’t request it to be so extended, yet I did request side tabs. There should have really been a discussion about their feasibility. My other Salva trousers were lined, so that is certainly possible to do. Generally I have cuffs when I want the trousers to be slightly more casual, and leave them off when I want them to be a little more formal. Does a tailor charge more for a bespoke suit when traveling abroad for trunk shows? Then, by how much? I have problem with my blue trousers , Would you please tell me what color ( shirts and shoes )will be match with steel blue trousers? A tricky one. Hard to say without seeing the precise colour in person, but try tan and then very dark brown. Yeah its really hard to find the prefect colour. I’ve worn white shirt with it but now i’m looking for new colours. Any issues in terms of using a heavier, flannel cloth with a Neapolitan tailor as I know Sal is not fond of the heavy Fox Brothers flannel cloths?